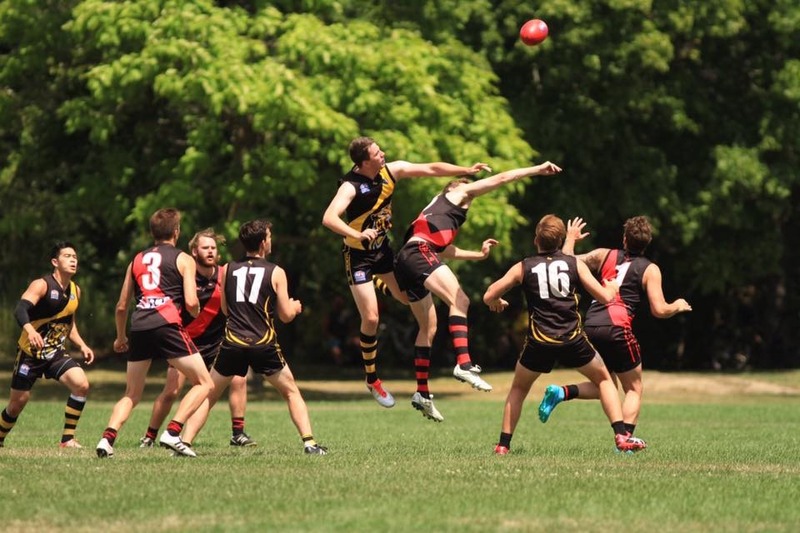 Following their defeat of the Demons, the Dingos returned to Humber South this past Saturday to host the Hamilton Wildcats in a crucial Round 8 match. Tied on the ladder at 4-3, the Dingos were looking to put some distance between themselves and the Wildcats and solidify their place in the top 5. 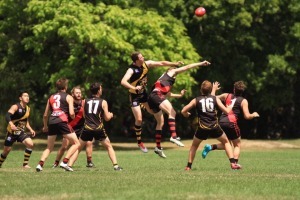 Playing in scorching temperatures that approached 40C, the Dingos matched the Wildcats and played 15-a-side. With the high heat and lots of open space around the ground, coach Robbo encouraged the boys to play direct footy and use their run to their advantage. Coming out a little flat, the Dingos gave up the first two goals to the Wildcats, before bouncing back and pulling ahead at the end of quarter time. With Tom Bell away, Rob Eckford was great in the ruck, allowing the boys in the middle to feed the footy forward to Noddy and Thomas. Jimmy was great all day, running hard in the heat and serving as a link from the backline to the forwards. New Aussie Justin "Judda" Davis was dangerous all over the ground and kicked two goals himself in his first game for the Red & Black. The Dingos were tested and pushed all game by the Wildcats, but were able to withstand injuries to Mick early and Eckford late to take a multiple goal lead into the fourth quarter. And, when the Wildcats made a final run and looked to chase down the Dingos, it was Canadian rookie Thomas who calmly put through final goal, allowed the Dingos to end the game on top. BOG went to Rob Eckford, who was unfortunately lost for the season due to a serious shoulder injury. Judda and Jimmy were honourable mentions. Next up: the Dingos will enjoy the long weekend and a well-deserved break before heading down to Hamilton for a rematch versus the Wildcats in Round 9.